You Have a Google Penalty. What Do You Do Now? - More Traffic. More Leads. More Business. A Google Penalty can cause a major drop in your traffic and rankings. Google will penalize your website for 2 reasons. One, for trying to manipulate rankings (or appearing to manipulate rankings) and, two, for delivering a poor user experience. Manual Action Penalties happen when a real person at Google reviews your website and sees that you are not in compliance with Google’s guidelines. Removing a Manual Action Penalty can take months and hundreds of hours of work. Algorithmic Penalties are tripped by algorithm filters that determine that your website has thin content, duplicate content, or content without any real value. Take care of the problem by upgrading your content and/or removing any duplicate content. Once Google runs its algorithm again, you should see your rankings start to recover. Log into Google’s Search Console. Under “Search Traffic” click on “Manual Actions”. 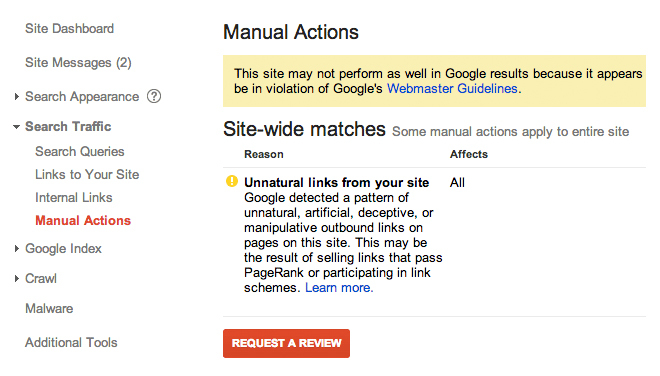 If Google has imposed a Manual Action Penalty on your website, you’ll see it here. A Google Algorithmic Penalty happens when Google changes one of the major parts of their algorithm and your site suddenly fails outside their new guidelines. In order to find an Algorithmic Penalty look at your Google Analytics and see If your website has experienced a drop in organic traffic. This could be a Google Penalty. Review several months at a time to see if you have had a sudden drop in traffic. If you don’t have Google Analytics installed, install it immediately! Bad backlinks are usually the cause of a serious drop in traffic. You can find your backlinks by doing a backlink audit of your website and creating a backlink profile. Do a manual backlink audit. Sort backlinks that need to be removed. Find any contact information available for the targeted sites. Contact webmasters and request backlink removal. Document all your work for your “Reconsideration Request” to Google. Add any websites that did not respond to emails to your “Disavow List” for Google. Submit “Reconsideration Request” with extensive documentation, explaining how the backlinks were obtained, what was done to remove them, and assurances that Google’s Quality Guidelines will be strictly adhered to in the future. The key to successfully removing a Google Manual Action Penalty is to find all your backlinks. Use several sources and cross reference all the links to get as many bad backlinks as possible. It is also important to keep as many good links as possible. Backlinks are still a very important part of Google’s algorithm. Removing good links will impact your search results in the future. It’s important to manually screen each link to verify whether it’s a good or bad link. Use your keyword in your content with a purpose. Don’t use the exact keyword in the title, url, header tags, image tags and internal links. Do your keyword research to find synonyms and long-tail variations of your keyword. However, don’t under-do your keywords for fear of a penalty. Write your content so that it’s appealing to your visitor and clearly lets Google know what your page is about. Website visitors are looking for high quality content that has direct and immediate value for them. If you don’t deliver, Google won’t serve up your pages. Google can see this though your analytics (see below). If your website isn’t delivering good content, or the right content for visitors, they won’t stay on your website long (low visitor engagement), or might leave without ever getting deeper into your site (high bounce rate). Lots of ads and affiliate links are red flags for Google. Google sees your page is more for generating clicks to ads and affiliate links and not very valuable for your visitor. If you have affiliate links and ads, keep the content towards the top. Don’t make your visitor scroll for your content. The screenshot below is part of a backlink report for a website that has a Manual Action Penalty. You can see that the backlinks are coming from spammy directory sites and automated link submissions sites. This website has thousands of these bad backlinks. All websites have some low quality backlinks, but if you find that your website has over 50% spammy backlinks, you should start getting those links removed. Google knows what kinds of websites should be backlinking to you. For example, if you have a fitness site and pet shops are backlinking to you, Google will see this as spammy or worse, a deliberate attempt to game the Google guidelines. All your content should be within 2 or 3 clicks from where your visitor enters your site. If your visitor can’t find what they want, they will bounce off your site. Creating a website structure that guides your visitors to the content they are looking for is probably one of the most important aspects when you are developing your website. Don’t pay for links. Google knows. ‘Nuff said. If you have been hit with a Google Manual Penalty you will find a message from your Google Search Console telling you that your site has been penalized.